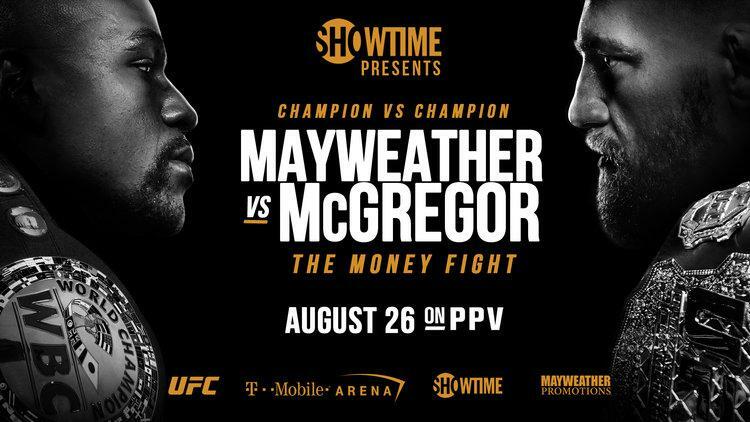 40-year old former five-weight world champion Floyd Mayweather (49-0, 26 KOs) will have the most to lose when he takes on current UFC featherweight and lightweight champion Conor McGregor (MMA record 21-3, 18 KOs) in a 12-round boxing match at the 20,000 capacity T-Mobile Arena in Las Vegas tonight. 29-year old McGregor is taking part in his first ever professional boxing match, but such is the Irishman’s high profile, force of personality and overwhelming confidence and self-belief, he has managed to ensure his debut comes against many people’s pick for best fighter of this era. It’s tough to argue that Floyd Mayweather isn’t a modern-day boxing great. He turned pro in 1996, and within two years had won his first world title, the WBC junior lightweight belt, from Genaro Hernandez. He ruled supreme in the 130 lb. class for three years, racking up eight title defenses against rivals like Angel Manfredy, Diego Corrales and Jesus Chavez. If Mayweather has a shout at being an all-time great in a specific division, it’s at junior lightweight, where he garnered the majority of his 26 stoppage wins. 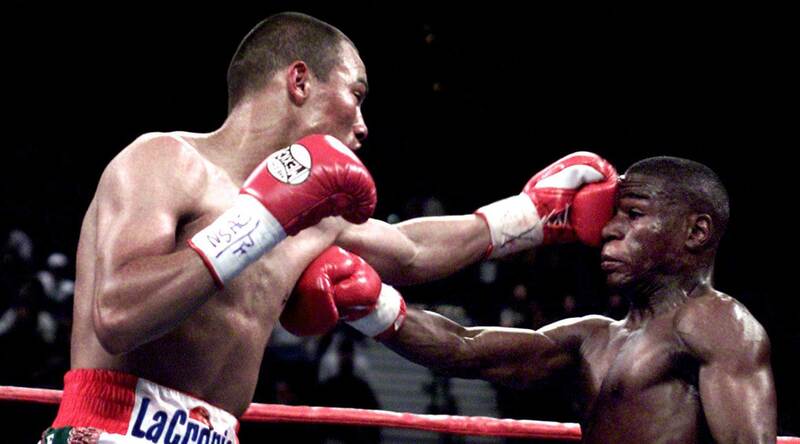 Mayweather began to climb the weight classes in 2002, and immediately hit a speedbump in the shape of Mexican WBC lightweight champion Jose Luis Castillo. Most observers believe that Castillo won comfortably, only to see Mayweather gain a close unanimous decision, a feat he repeated six months later. From that point on, Mayweather and his management began to carefully assess opponents from the viewpoint of minimum risk, maximum reward, and the fighter himself began to box with less aggression and more attention on defense. Mayweather had a fleeting sojourn at junior welterweight in 2005, winning the WBC belt from a shopworn Arturo Gatti while sidestepping the chance of a big fight against the very real threat of power-punching Kostya Tzu. In 2006 Mayweather set up base camp in the 147 lb. welterweight division, where he has spent the bulk of his career, aside from a couple of brief sorties up to 154 lbs. Mayweather’s welterweight reign has been both frustrating and disappointing; he has feasted on a succession of blown up featherweights (Robert Guerrero, Juan Manuel Marquez, Manny Pacquiao), lightweights (Shane Mosley) and junior welterweights (Ricky Hatton, Victor Ortiz, Miguel Cotto, Marcos Maidana) while avoiding genuine welterweights like Vernon Forest, Antonio Margarito, Corey Spinks and Paul Williams like the plague. While Mayweather is clearly a very talented and highly skilled boxer, he will retire never having faced another great fighter at their peak, preferring to wait until a rival is old, as in the case of 39-year old Mosley, shopworn, as in the case of a twice KO’d Cotto, or both, as in the cases of Pacquiao and Oscar De La Hoya. He even took on Saul “Canelo” Alvarez as a raw 22-year old in 2013, winning clearly but proving little. Canelo has since become a world-class fighter and pound-for-pound contender, and more than capable of avenging the Mayweather loss. 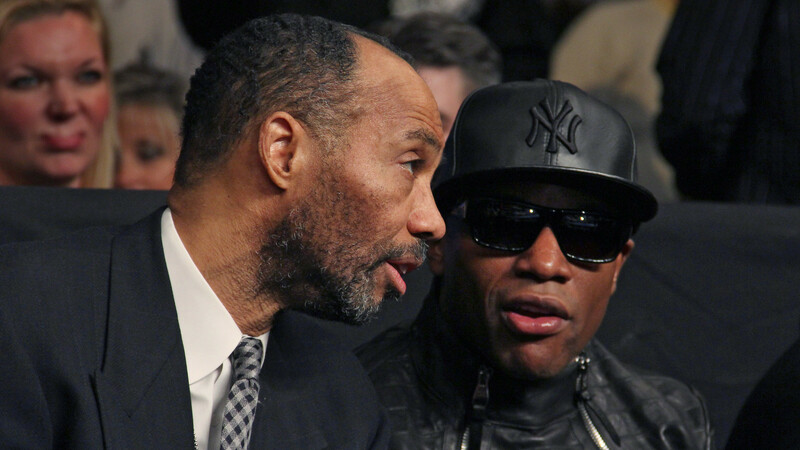 Under the skillful handling of manager and advisor, former music impresario Al Haymon, who spotted his charge’s penchant for arrogance and obnoxious behavior, Mayweather became the ultimate “heel”, the fighter fans loved to hate, and were willing to pay in the hope of seeing him lose. How much Mayweather was actually in on this act isn’t clear, often he seemed surprised, even hurt when an audience would boo him and cheer for his opponent. 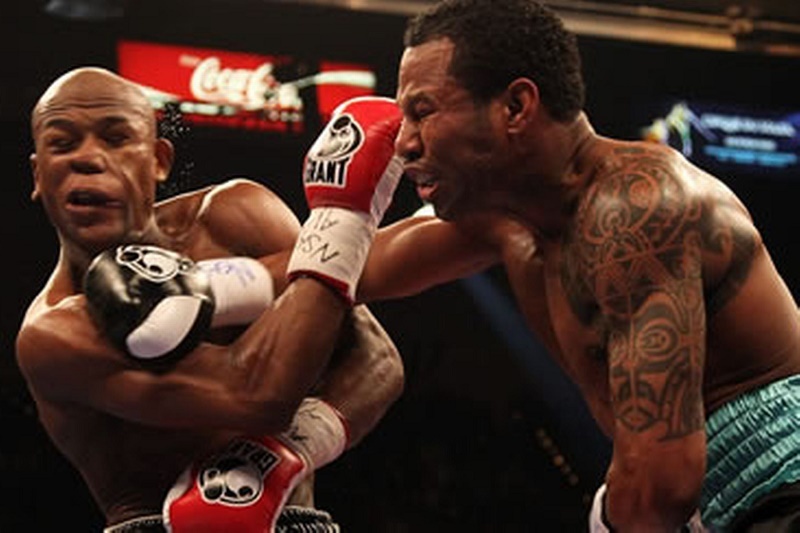 Mayweather has also had his share of dubious decisions in his favor, and aside from the daylight robbery of his first fight with Castillo, Floyd was highly fortunate to escape with wins over De La Hoya and Maidana. Now Mayweather risks having his carefully orchestrated career, record and legacy decimated by a boxing novice in front of an estimated 1 billion viewers. When Conor McGregor joined the UFC in 2013, he was so broke financially he was forced to sign on the “dole” in Ireland, the equivalent of welfare in the US. A former schoolboy boxing champion and talented soccer player, McGregor had fallen in love with mixed martial arts in his late teens, and began competing professionally in 2008 with varying degrees of success, compiling an uninspiring record of 4-2 by 2010. 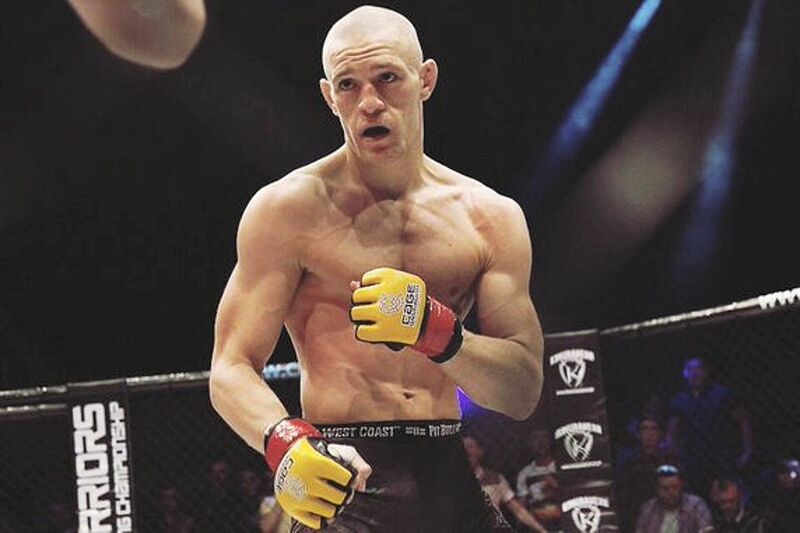 Under the tutelage of John Kavanagh and Owen Roddy, his trainers to this day, McGregor began to improve, winning world titles at featherweight and lightweight under the banner of the tiny “Cage Warriors” MMA organization. 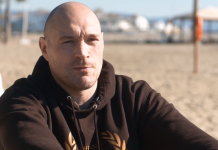 Clearly he had the talent and the drive, but was getting nowhere fast until UFC boss Dana White spotted him and invited him to join his organization in 2013. With the global platform of the UFC as his stage and a string of KO victories, the braggadocios McGregor soon began to attract attention and gain a following. The unexpected success of female UFC fighter Ronda Rousey in 2015 suddenly gave MMA a profile it had never previously enjoyed. Ronda’s all-action, aggressive style of fighting saw her overwhelm opponents in seconds, giving her an almost Mike Tyson-esque aura. In a short space of time, Rousey was everywhere, on TV chat shows, on magazine covers, in movies, and fighting in front of 50,000 frenzied fans in Australia. In an omen of things to come, she was even calling out Floyd Mayweather. In 2015, she was the no.1 earner in female sports, ahead of Maria Sharapova and Serena Williams. 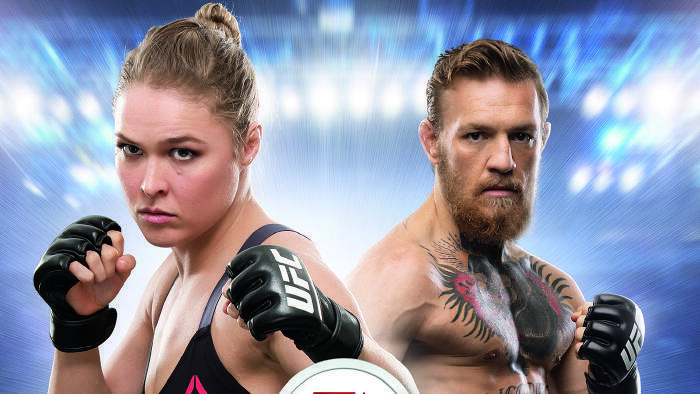 Unfortunately, back-to-back defeats saw Ronda Rousey crash and burn all too quickly. 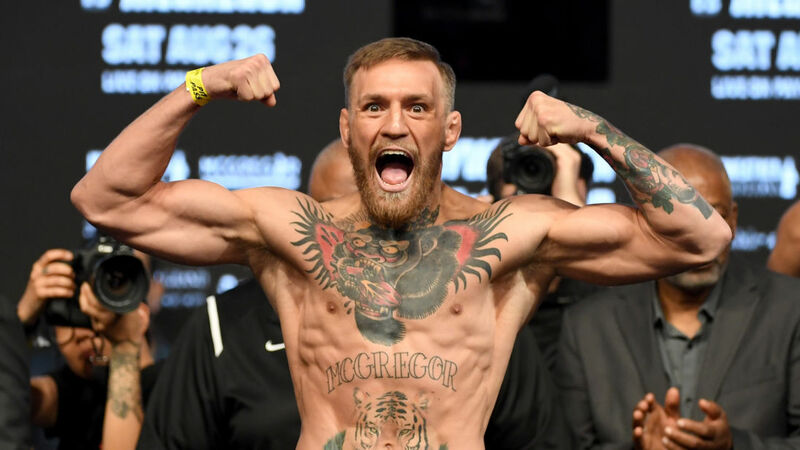 However, the knock-on effect was that sports fans suddenly wanted more UFC, and by now, Conor McGregor was fully-formed as both a fearsome competitor, a supreme showman who clearly love the limelight, and ready to fill the void left by Rousey. What set McGregor apart from many UFC fighters, and made him more palatable to traditional boxing fans was that the bulk of his bouts ended as the result of his heavy punches, rather than from grappling or kicks. In 2015, McGregor took on the ten-year unbeaten Jose Aldo, one of the biggest names in UFC. After a huge buildup and a ton of trash talk in which McGregor promised a first round knockout, the two met at the MGM Grand in Las Vegas in 2015. After a brief exchange, Conor KO’d Aldo in 13 electrifying seconds, and the McGregor Myth was born. In 2016 McGregor split two epic wars with Nate Diaz, losing the first on a tap-out but winning the rematch on points in one of the most grueling encounters in UFC history. In his most recent bout in November 2016, McGregor KO’d Eddie Alvarez in two rounds. The victory gave him the UFC lightweight title to add to his featherweight belt, making him the first man to hold two UFC titles simultaneously. Now McGregor will attempt to make history once again. What Will Happen On August 26? Paulie Malignaggi emerged from the Conor McGregor training camp a few weeks back very much like a dog which was barking loudly but whose tail was between its legs. 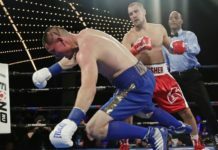 No matter what the likeable Malignaggi – a two time world champion and now an expert boxing analyst on Showtime – said, that McGregor was sloppy, that he had no power, that he gassed out, and that he (Paulie) had dominated sparring, the pictures and video clip that emerged showed otherwise. Clearly Paulie had been beaten up and dropped by McGregor in sparring, and had left the camp in a proverbial huff. While Malignaggi had been in semi-retirement prior to getting the call from the McGregor camp, he was still a top professional, and synonymous with boxing skill, and yet McGregor had had little problem landing on him, which instantly dispelled the myth that Conor would not be able to cope with the “distances, timing and dynamics of boxing”. 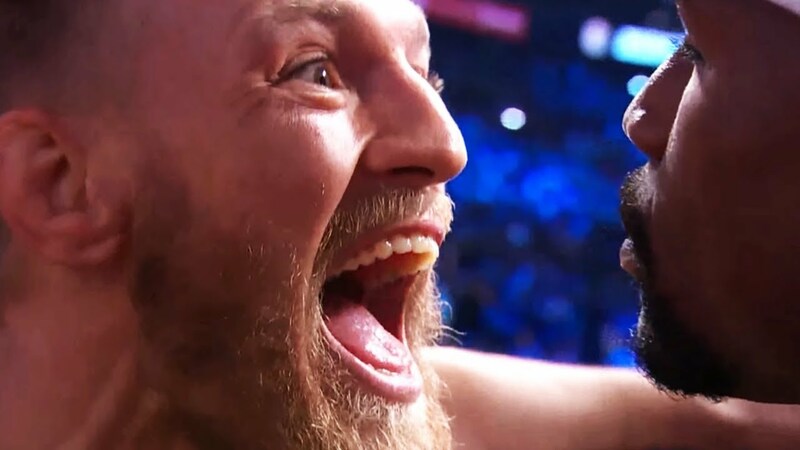 Crucially, McGregor has stuck with the Kavanagh-Roddy combination in his training, and not employed a top boxing coach like Freddie Roach or Robert Garcia, which would have been a mistake. Aside from his size and youth, one of McGregor’s key factors is his unconventionality in the ring. Mayweather will have never dealt with someone who comes at him and throws punches quite the way that McGregor does. 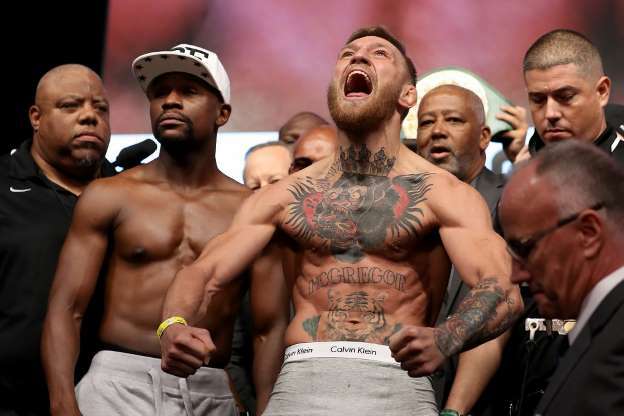 Mayweather claims to have trained as hard as ever for this fight, but he was clearly carrying a layer of water and fat at the weigh in in which he scaled 149.5 lbs. (McGregor was 153 lbs.). His abs were still deeply etched, and he was carrying a little more muscle bulk, but he wasn’t ripped. He’s a 40-year old man who was happily enjoying retirement when he suddenly realized he couldn’t pay his tax bills, and needed to come back. 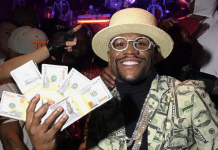 He could have risked his “O” against one of the new champions at welterweight, Keith Thurman and Errol Spence, or even gone for a second Manny Pacquiao fight, but instead took what he perceived would be an “easy out” against McGregor that would still net him a ton of money – literally, take him to 50 and O, and safeguard his legacy. How wrong he has been. From the first verbal exchanges and faceoffs on the four-city press tour, it was clear that Mayweather was dealing with a different kind of animal in McGregor than he is used to. 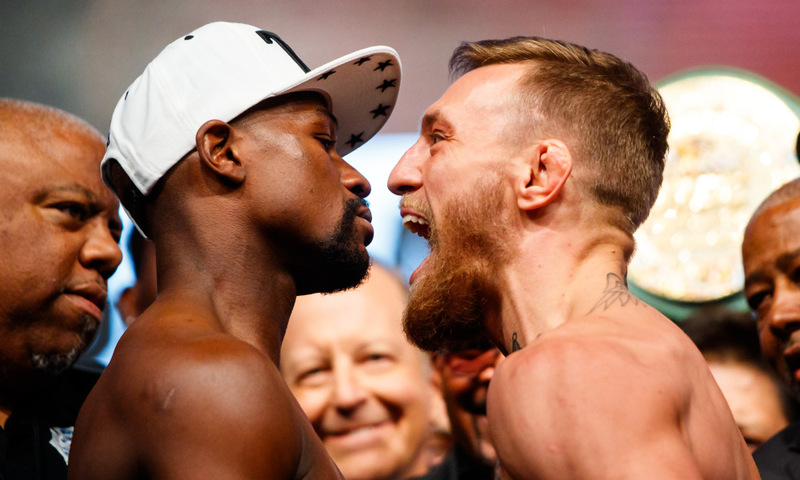 As Conor’s confidence has grown, Floyd’s has faded, and at yesterday’s weigh-in and ensuing standoff, he looked uncomfortable, concerned, scared even. He was literally lost for words as the deranged apparition that is Conor McGregor snarled obscenities into his face. Right at that point, it was clear, Mayweather is already a beaten man. If this fight is on the up-and-up, and not an elaborate hoax designed to hoodwink the public and con us out of what could be a billion dollars, McGregor will defeat Mayweather by KO or TKO in Las Vegas. McGregor’s size, speed, power, footwork, self-belief, and crucially, his southpaw stance that will render Mayweather’s patented shoulder-role useless and thus eradicate 50% of his defense will all be too much for a small, slight, middle-aged man who until now has been protected but has suddenly been cast out into the big bad world and discovered it is a nasty, cold, horrible place. This isn’t about who is the better boxer, it’s about who is the better fighter, and right now, Conor McGregor is a far better fighter than Floyd Mayweather. And he won’t need his feet or grappling skills to prove it.